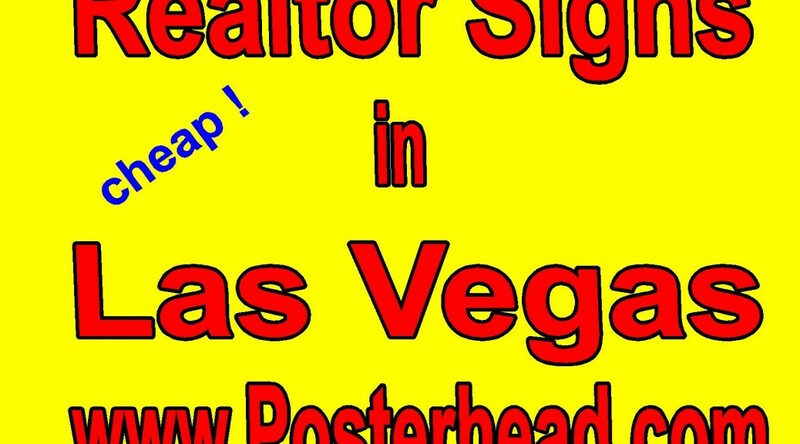 Builder and contractor signs in Vegas are available at local sign companies. Builder and Contractor signs are signs like dust control signs, no trespassing signs, project signs, safety signs, etc.. Many of the signs are mandated by government agencies and many signs are just for promoting a project or a company. For example, the Clark County Air Quality Board regulates construction sites for dust going into the air. 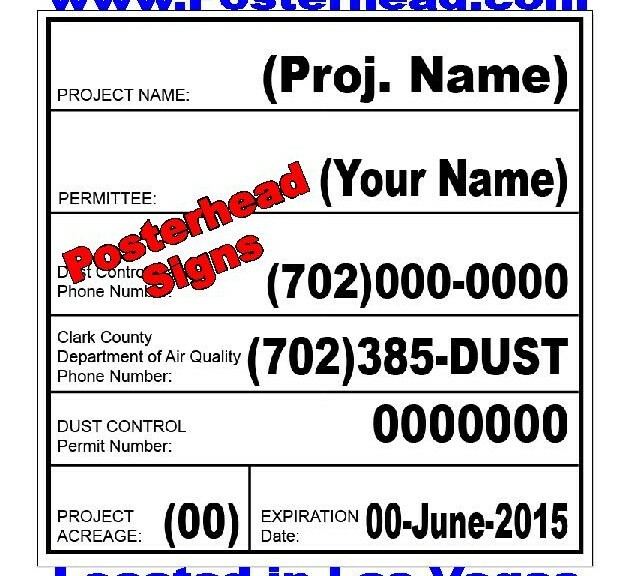 The Air Quality Board mandates dust signs on projects where dust is going to be moved. Nevada Division of Environmental Protection regulates water runoff and requires certain signage and regulation enforcements. Builder and contractor no trespass signs are also sometimes regulated by government agencies but more common sense for the contractors or builders to place on properties they are developing. With all the homeless and vagrants in Clark County, it only makes sense to have your construction or building project protected with signs warning no trespassers. Not only do you not want them on your property for safety reasons ( God forbid they get hurt ! ) but also in case they take up some form of residency that requires an eviction. Project signs are becoming more and more common in Las Vegas at sites because they let people know what is going to be built and promotes the future site. Contractors like putting up project signs as well because it helps identify them and make them stand out among their competition. These project signs can be any size, but usually they are 4ft x 8ft or larger and on MDO board so that they are heavy and can help withstand the winds that suddenly come up in Vegas during the different seasons. Builder and contractor signs are available at sign companies throughout the Las Vegas area. See how these signs can help and protect your company. January 8, 2019 Robert W.
Clark County Las Vegas no trespass sign is a bright orange sign the county government likes to be posted. Clark County Las Vegas orange no trespass sign is one that the Clark County likes that has information on it in both English and Spanish. The no trespass sign has information regarding the trespass codes and the illegal dumping codes. Clark County Las Vegas orange no trespass sign comes in many different sizes. The two most common sizes are the 12″ wide by 18″ tall no trespassing sign and the 18″ tall by 24″ wide no trespassing sign. In addition, vacant land owners prefer the much larger 4ft x 4ft no trespass sign for posting on property. In today’s society, many land owner have seen unwanted people camping out on there vacant land and making temporary homes. Not only are these people bringing unsanitary conditions to the property, they are bringing their trash and debris which is causing county government code enforcement to bring actions against the land owners. In California, people that do not have no trespassing signs on their properties are being given tenant rights and legal evictions are being done through the courts at a great expense. Clark County Las Vegas orange no trespass sign is the first defense against unwanted people on your property. Many construction sites are not employing these no trespassing signs as a way to control liability from people walking onto their construction sites and living in half built homes or damaging their site. The no dumping sign is the other part of the sign that forbids people from dumping unwanted material on a construction site. The Police require posting notices before they can take action to protect your property. 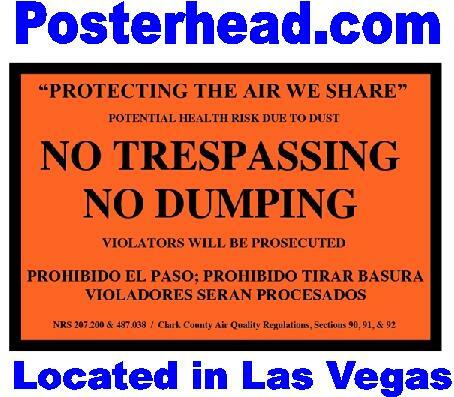 Clark County Las Vegas orange no trespass sign is available at your local sign store in Las Vegas . January 7, 2019 Robert W.
Sidewalk plastic spinner signs for advertising is a unique approach to get you business noticed. It is basically a kid spinning a 2ft x 4ft or 2ft x 5ft plastic sign on a sidewalk to entertain the passing vehicles that promotes your business. This advertising method is also called sign flipping and it is very entertaining for people who are trapped at a traffic light to watch. Sidewalk plastic spinner signs are a very cost effective approach to get people to take notice of your business. Sidewalk plastic spinner signs are cheap. They basically cost anywhere from $50 to $80 for a double sided sign. On the sign you could have your products or just company name with an arrow pointing to your store. It just depends what you would like to advertise. A local auto oil change store uses spinner signs to get the attention of passing motorists. When these mechanics are not working ( they are on commission- not salary ) they use the sign to attract business by simply standing out on the sidewalk and holding the sign stating that a oil change can be performed quickly at a certain price. When the cars start driving in, the mechanics simply go back to working on the cars. The employees are happy to do it as they make no money if they do not work. Another fast food taco place has their employees offer 99 cent tacos on a spinner sign when they are slow. The 99 cent tacos really bring in the customers and gives the employees a break form cooking or taking orders. Sidewalk plastic spinner signs is a easy way to improve your business at a low cost. 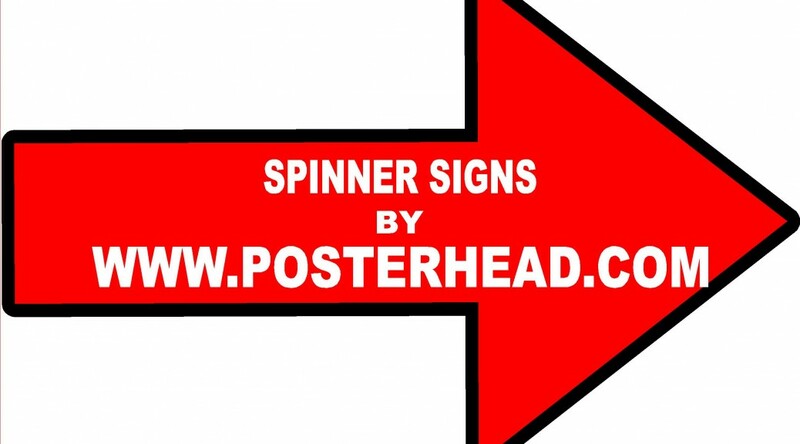 These spinner signs will create more awareness of your business and drive traffic to your store. These signs are also great for concert or event parking to help direct people to the right place to park. 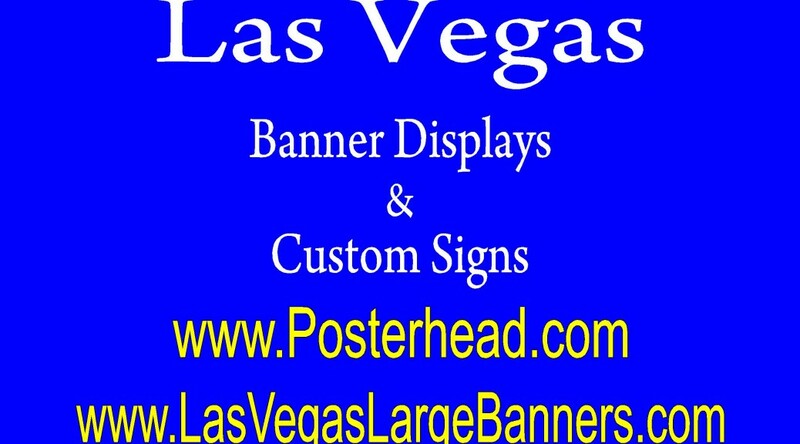 Low cost sidewalk signs in Vegas are a cheap and effective way to advertise your store. These very mobile sigs are lightweight and can be placed next to the sidewalk so they can be seen by all the passing automobiles. Low cost sidewalk signs allow for the advertising inserts to be changed out, so you can rotate your advertisement to always reflect new merchandise or specials. Low cost sidewalk signs are being used by stores all over the Las Vegas area because these sidewalk signs are very portable and you can easily move them around to best fir your needs. Stores are placing these sidewalks signs in front of their business , near the street, so that they can take advantage of all the cars passing by. Las Vegas traffic has increased dramatically in the last few years with all the Californians moving in and they will take notice of your signs. With thousands of more vehicles on the roads, major streets are seeing over 10,000 cars a day travel by according to the department of transportation. By placing your sidewalk sign near the street, you are bound to attract the attention of people driving by. Smart businesses are rotating he inserts that go in the sidewalk sign so that fresh advertising content is always seen to promote new items. Best of all, these inserts can be rotated on a weekly or bi weekly basis and get noticed. The time to change the inserts to other inserts is less than one minute ! 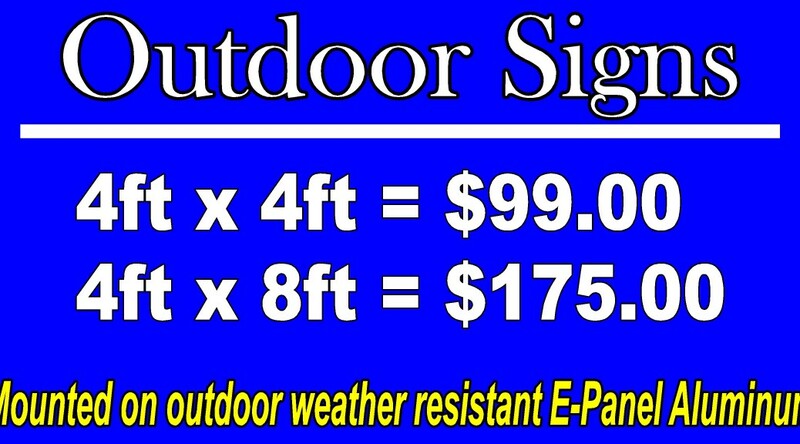 Low cost sidewalk signs are available at sign stores in Vegas at very good pricing. 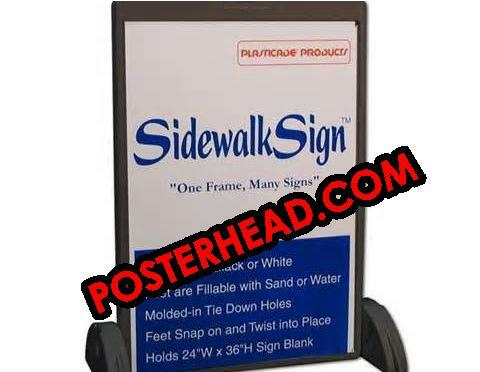 Many sign stores offer the Plasticade deluxe ( easy change out) sidewalk sign with 2 full color coroplast inserts for under one hundred twenty five dollars. These sidewalk signs can be ordered and made within a day or so.